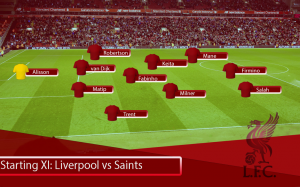 Starting XI: How should Liverpool line up against Southampton? Six cup finals to go. Sunday’s result could spark the finish we need to go all the way, but Liverpool fans will be hopeful of a more comfortable victory on Friday night. The Reds must focus on each game – It’s Liverpool who will put pressure on City by continuing to win matches. Southampton have shown they are capable of getting results against big sides. The Saints are not safe from relegation yet, which means Klopp will need to play the strongest team possible to ensure all three points. The back five must remain the same until next week against Porto. Fabinho’s short appearance on Sunday was enough to see why the Brazilian was so highly rated at Monaco. For now, he is the preferred option in the six over Henderson. This game is a good chance for Naby Keita to come back in. It’s foolish to write Naby off when he’s only played nine games in centre-midfield this season (and performed well). Alongside him is James Milner who produced another solid outing on Sunday – Gini will benefit from a rest after playing three games in ten days. Milner’s experience in the title race will be key in this final stage of the season. The front three remains the same, although the recent performances of Divock Origi will probably merit an earlier substitute if the attack are not performing. We have to be clinical. Southampton will be tricky opponents, but our squad is more than capable of dominating the game and taking three points convincingly. It’s been mentioned before in these previews, but I feel like we have another gear to go into. Can Salah’s contribution to the goal at the weekend ignite the Egyptian King’s campaign? Our attack will be unstoppable if so.